Vegetable garden, a photo by alison.toon on Flickr. There was order to this once. 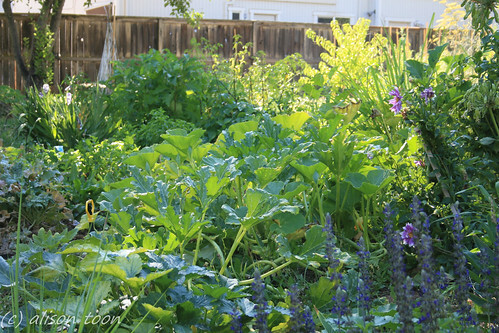 Each different squash plant had its own place, and there certainly were not any melons planted among the beans, nor any tomatoes with the tomatillos--those guys appeared all by themselves, or moved from where I planted them. The winter and summer squash have tangled and sprawled and woven themselves into such a jungle that it's impossible to see where any of the fruit originate, so it's guess-the-squash time. The tomatillos have rampaged, the borlotti beans have climbed their poles and also the close-by gladioli, and there is a huge clump of lemon grass ready for Thai sauce and tea. It's a mess, but it's wonderful.